In my last post I wrote about how computational capabilities are capable of displacing humans from many, many jobs. With computerized, self-driving cars within technological reach the postal service, Fedex, UPS and innumerable other enterprises could quickly cut their labor costs – and that is just one example. A huge range of human endeavors could be automated, including some of those conducted by professionals such as pharmacists. Given that scenario, what would people do? Stuff would be cheaper, but it would be a lot harder to make any money – presumably there would still be some jobs. There might be particular functions that were extremely difficult to automate even with access to massive computing power. (I can imagine clothing sales still being a human function – I just can’t imagine a machine saying in a compelling way, “That outfit works on you.”) People will probably still produce entertainment and some business and political leaderships will still be needed to make critical decisions. Algorithms might identify various optimal distributions of goods and services, but people will need to consider the less easily calculated moral and emotional aspects of these decisions. Broadly there are two future scenarios. This is not an immediate future, it is worth remembering that for most of the world’s population these technological advances are far from their everyday lives. The utopian version is one in which everyone enjoys plenty (or at least freedom from want). Some people will pursue regular careers that bring them modest wealth. Many work for a time at a few critical human-dominated fields before “retiring” early. But many take advantage of this plenty to become professional hobbyists – earning modest livings through part-time endeavors as artists, chefs, entertainers, history buffs etc. In short, in the future the world is a vast artists colony in which comfortable people pursue self-actualization. This is the vision of humanity as a bunch of modest trust fund babies. In the dystopian version, the world resembles a vast government housing project in which almost everyone is given just enough to get by and no one has much of anything to do. People pursue worthy hobbies such as alcoholism and hooliganism. The truth is the future probably has a bit of both of these scenarios. More and more people are finding extremely interesting things to do (look at all the professional bloggers out there – in my case I look with jealousy.) I’ve been listening to the WTF podcasts by stand-up comedian Marc Maron who does this really cool engaging show out of his garage. He’d never find a mass market on a network, but thanks to the low production costs and ease of distribution he is able to find an audience. On the other hand, most of the Western nations with well-developed welfare systems have seen the growth of a permanently under-employed class (this isn’t just in the US, Western Europe has it too – just with less violence.) This could expand as more and more people find themselves with minimal employment prospects. But this expansion could have very nasty consequences; particularly as this environment of anomie is also a wonderful breeding ground for extremism and violence. People need to feel useful to be satisfied. But the future then looks like the present only more so, with the rich getting richer and the poor getting poorer. Presumably, even in the heavily automated world of plenty the creative, ambitious, and talented will find things to do. I worry about everyone else. From a policy standpoint there are limited options. No education system will turn dumb people into composers or astrophysicists. But even a mind of low intelligence is a very impressive thing. Just as I know I can never be an athlete, but I can press my body within its (very) limited capacities. Everyone can be taught/habituated to use his or her mind more fully. In doing so, we can also help focus on what humans really are good for. Finally, the Utopian scenario may not be all it is cracked up to be. Europe at the turn of the 20th century was a worldly, wealthy, sophisticated civilization. Yet the entire continent turned on itself with an unbelievably fury. Human nature is a constant - we'll find ways to make ourselves crazy. I recently read an article about the business philosopher Clayton Christensen. His core idea is about how well established businesses are overtaken by disruptive innovations at the bottom of their market. A classic example is the steel mills being overtaken by mini-mills. At first big steel was happy to cede the low end of the market to the new mini-mills. The low end of the market was re-bar (reinforcing bars) that were buried inside concrete to add strength. It was the cheapest steel and had the lowest profit margins. The big steel companies were happy to cede this aspect of the business. But the mini-mills started getting better, moving up the ladder of sophisticated and profitable products until they were challenging big steel at the top of their game. Big steel had enormous physical plants and sunk costs and suddenly could not compete. This has happened in industry after industry according to Christensen. When transistor radios first came out they were junk compared to the sophisticated vacuum tube radios, but they were cheap. Teenagers, who didn’t have any money, bought them. Over time the transistor radios improved and tube radios basically don’t exist anymore. This also occurs in military affairs. When the Bronze Age Greek civilizations were over-run by the iron using Dorians, it wasn’t that the Doric iron weapons were better. The bronze weapons of the sophisticated Greek civilization were quite advanced – but they iron weapons were much cheaper and easier to make. Here is what struck me as I read about Christensen. Computers are getting better and better at what they do and automation is replacing a lot of jobs humans do – and not just in clerical tasks – but also potentially in some sophisticated ones. Watson, the IBM computer that defeated several Jeopardychampions (and my old boss) equaled the human mind in a very specific area and occupies several rooms. But, soon enough Watson will be living in your phone (Siri is a very bad, but relatively cheap, fore-runner). The Muzak Corporation no longer develops the cheesey, bland sound-track known as elevator music. They generate sophisticated packages of music for different environments, including custom-made selections that add an audio dimension to a carefully tailored environment (retailers are the major customers.) In this New Yorker profile, one of the Muzak architects asks the author a series of questions about himself and creates a “personal audio imaging profile” and a six-song personalized CD. The author is struck that while he hadn’t heard of any of the artists on the CD, he really liked it and even bought some CDs of the artists. Could a computer do that? Not yet, but consider the automatic iTunes recommendations based on past purchases (personally, I know very little about this). Right now they may be of limited utility to serious music aficionados appear eons away from the sophisticated capacities of the Muzak Corporation. But the algorithms of iTunes and other online music sellers will become continually more sophisticated. What happens to the company when an individual or business can subscribe to a highly personalized music selection service for a far lower price? This example is at the high-end, but there are innumerable examples at the low-end as well. Automated cars are close to being a technological reality. How many people work as drivers around and what will they do when robot vehicles do all of the driving. One can imagine the Muzak architects finding new and interesting things to do. But what about the many, many people who drive for a living? Will they start writing screenplays or becoming research scientists? This scenario will play out in industry after industry. The very best maps are still made by hand, but computer generated maps are cheaper and usually good enough. This would seem to be the argument of the “buggy whip makers” who were put out of business with the coming of the automobile. But I don’t think so. Most inventions replaced human brawn – which isn’t what people are best at anyway (pound for pound most animals are far stronger.) People still had hands, minds, and mouths, which could (particularly in combination) perform functions that were not easily automated. But these new capabilities are edging into core human functions. Are we sliding into the world of Kurt Vonnegut’s novel Player Piano in which machines do all the work and people are left with nothing to do? I am afraid I have nothing to say about Christmas - not my thing, but I recognize it was a profound moment for all of mankind and for those for whom it is significant I wish them all good things. On most levels, absolutely not. Pharoah set Joseph above all but himself. But he did not make Joseph his heir. Joseph was still "help" or, as we would say it now, "staff." Further, traditionally the vizier's role was as Executive Officer. In effect, the XO makes sure the ship is running well, wherever the Captain wants to take it. The U.S. Constitutional system does not really have space for a formal XO. In some ways the White House chief of staff fulfills that role. Sometimes there is a particularly prominent cabinet member (Jim Baker in the case of Bush Sr.) who plays the role of mayordomo. But vice presidents tend to shy away from this role, although in rare instances they will undertake efforts on the President's behalf on particular issues in order to energize the bureaucracy. Arguably Cheney, as Bush 43's VP did take on this role. Cheney does not prove that the VP is inherently unsuited to this role - it is more accurate to say that many people were unhappy with his policies. On a gut, non-analytical level, I believe that having the VP appear to run day-to-day operations is deeply unpalatable to the American people. On a common-sensical note, the VP cannot be fired, thus if they fail as "vizier" the President is stuck. But Joseph achieve his role through tremendous competence (everywhere he showed up he ended up being placed in charge), but also through dream interpretation. It is not a goofy "New Age" idea that dreams often are telling us something profound. Further, with a little elaboration, it is easy to imagine that Joseph is collecting intelligence about what's going on that helps inform his interpretation. He was tracking palace intrigues as well as information from throughout Egypt. So when the dreams were described, Joseph was well-placed to understand the deeper anxieties provoking them. Vice Presidents are not dream interpreters. The US probably does not need a President going through a Jungian vision-quest. But, one can imagine a VP, with his own sources of information, helping a President see where he really wants to take the country on a given issue. A clever article in Foreign Policy describes Israel's near-future status as an energy power. The article begins with a variation of the old joke, "If only Moses had turned right instead of left, we would have gotten the oil." But the reality is that oil and other forms of easy natural wealth are more often a blessing than a curse. Time and again national prosperity and industry is overturned by the easy riches of mineral wealth. The general explanation is that the money makes the people lazy, and perhaps there is some truth to this. But there is another explanation, known as Dutch disease (for when the Netherlands discovered huge natural gas reserves in the North Sea.) Basically, the expanding exports push up the value of the national currency which makes their industries less competitive. Consider, with oil money driving up the international buying power of Venezuela's currency a cattle farmer in that country is now competing against suddenly cheaper meat from abroad. So really, Moses did the Jewish people a favor missing the easy oil riches of the Arabian peninsula. However, advanced economies can manage the impact of energy wealth more capably than under-developed ones. The Netherlands and Norway took steps to prevent their newfound energy wealth from undermining their other industries and Israel can do the same. Meanwhile, the huge energy finds could be an important blessing for Israel. First and foremost, energy security is a positive and with cheap energy Israel could possibly undertake massive desalinization projects. This could be a boon in its own right to the Israeli economy (innumerable industrial processes require substantial amounts of water). Energy exports can be used to foster strategic relationships with other countries and, as the recent UN vote indicated, Israel is hardly awash in friends on the international scene. And of course, the money generated from energy sales would be helpful to Israel. High defense spending and inefficient government industries continue to hamstring Israel's economy Greater resources could be helpful for some of these problems. Finally, the combination of energy, water, and money are useful cards to play in negotiating with the other players in the region. The history of the region obviously provides little support to the thesis that the Arab powers are ready for economic cooperation with Israel - no matter how lucrative. And leaders everywhere have to tread carefully in deals in which material goods are gained in exchange for concessions of items of symbolic value. No Palestinian leader will want to be portrayed as handing over Jerusalem for money or water. Still, these items will be useful cards in Israeli hands in its dealings with its difficult neighbors. Also, cheap energy might be squandered. I read somewhere that when asked why, despite being surrounded by it, Icelanders don't eat cod, and Icelander responded, "We don't eat money." Perhaps Israel could use its wealth to develop alternative energy, thus maximizing both revenue from its energy resources and continuing to be a font of innovation in a critical sector. But perhaps the greatest blessing the energy industry could bring to Israel would be an important development in Israel's human resources. An energy industry requires large-scale organization and coordination. So far, the primary source for large-scale organizational skills in Israel is the IDF. One can be a deep admirer of the IDF, while still recognizing that an alternate source of high-level management skills and strategy would serve the country well. Israel's economic miracle has been rooted in its human capital. Among the many blessings Israel's new energy wealth can bring will be new avenues to develop this resource. Right now it is easy to pick on the NRA, but let's seriously examine their proposal - armed security at every single one of our nation's schools. (I already took a brief look at this question). There are over 130,000 schools in the United States, so a program to place a competent, vetted, armed guard would probably cost something along the lines of $10 billion (give or take a few billion) - but figure 100,000 security guards at $100,000 annually each (that would include administrative costs, training, vetting, health care etc). A lot of money, but not an impossible amount if the problem is severe enough. But is the policy in proportion to the problem? School shootings are on the increase so let's assume about 30 deaths per year, not 10 (this year saw 37, and the worst year for school shootings - which included the Virginia Tech Massacre - saw 44). We will also ignore some of the other costs of this kind of program - if you bring 100,000 new people into schools it is almost statistically certain that some will be child molesters or engage in some other sort of deeply inappropriate activity. Children are precious, of course - but $300 million to save a single child's life seems like an enormous expense. Obviously the numbers are estimates, but any reasonable changes would still result in an extraordinarily expensive program. $300 million could easily fund some serious national efforts to promote and enforce firearm safety. Since about 800 people per year are killed in firearm accidents, a program that made a modest dent in that number would be far more cost-effective. I am by no means an expert on this issue - just a dope with a blog and some background in policy analysis. Many of my readers (assuming I have any) will not like the politics of these proposals . Others will be disappointed with their modesty - i.e. too many studies, not enough action. But modesty is in order, particularly on the third leg of the stool, mental health. It is not clear that the field is advanced enough to support large-scale initiatives for mental health screening. Large-scale national initiatives will reap lots of false positives that will be expensive and ruin lives. Before jumping on a National Mental Health program, some study is essential and part of that study should be on the legal questions of how to best handle the mentally ill who cannot make prudent decisions on their own behalf. There is a tendency to over-correct in response to a crisis, but the over-reactions can have deep consequences of their own. In the decade since 9/11 hopefully that lesson has been learned. One measure of the expansion of the Vice President's role is the increasing prominence of the vice president's staff. Under Carter, the Vice President's Chief of Staff also became an Assistant to the President and performed numerous tasks on the President's behalf. Still much of Mondale's influence came from having allies on the President's staff. The same was true of George H. W. Bush, who during Reagan's first term benefitted enormously from having his close friend James Baker serving as the President's chief of staff. But under Gore the formal integration of the Presidential and Vice Presidential staff continued. The VP's chief of staff was again an assistant to the President. However, previous National Security Advisors to the Vice President (VPNSA) had had a lower profile. This changed, Gore's VPNSA Leon Fuerth was by most accounts present at most major National Security Council meetings and was an intergral part of the decision-making process. This was continued (and probably expanded) in the Bush Administration, where Cheney's chiefs of staff also held the rank of advisor to the President. But this integration has reached a new level in the Obama-Biden administration. First are the number of people with strong links to Biden in the West Wing. But also, according to the invaluable Plum Book, besides Biden's chief of staff, there are five Biden staffers who also hold the rank of Deputy Assistant to the Vice President (including the chief of staff to Jill Biden) and two more who are Special Assistants to the President. But a picture tells a thousand words. 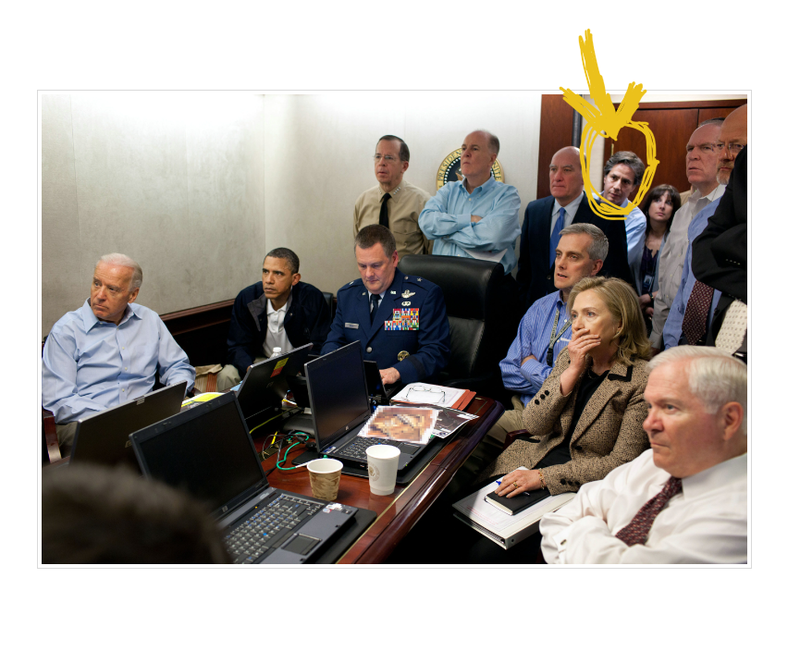 In the now iconic picture of Obama and his team in the situation room monitoring the raid that killed Osama bin Laden, indicated in the picture with a big yellow circle and arrow (helpfully added with the app Penultimate) is VPNSA and Deputy Assistant to the President Antony Blinken. He may not be in the front row - but he is in the room. And in government, once a position/procedure/protocol is established it goes on forever. I am horrified by what happened in Newtown, as anyone would be. But I am a policy analyst, with some specialization in counter-terrorism - which has some overlap. So the only thing I know how to do is consider and evaluate options. I do so with humility. We must do something, but it would be best that whatever is done is more than symbolic and also effective. Politics, and hence policy, is the art of the possible. There are appear to be three basic approaches, which are not mutually exclusive. The first is to reduce the availability of guns, the second would be to harden the potential targets, and the third option is to attempt to detect possible mass shooters before they act. There are no magic wands with any of these options. Undoubtedly there are prudent, reasonable gun control measures that could be adopted and that would reduce the ability of bad people to get their hands on deadly weapons (Emily Bazelon in Slate outlines some approaches). This is all to the good. The details of gun control are beyond me, but the obvious point is that there are already hundreds of millions of guns in circulation in the United States. Programs may reduce that number and better regulate them - but this will be at the margins. There will still be enough guns (and ammunition) "out there" that determined malefactors will be able to obtain them. Aggressively pulling guns out of circulation will require large-scale intrusive and coercive government action that is not politically realistic and would probably have other consequences that would not be good for the country. One example is Australia's mandatory buy-back program after a 1996 mass shooting. But at the time there were about 3 million guns in circulation in Australia (one for every seven Australians.) The ratio in the United States is closer to one gun per person. Enforcing mandatory buy-back program for certain classes of firearm on that scale would either require extensive major law enforcement operations or would become an unenforced law. Either path is problematic. None of this is to say that reasonable gun control measures should not be undertaken, only that there are limits to what they can achieve. Another response is hardening the targets. More than a few observers have noted that had there been an armed security guard, it is highly probable that the Connecticut incident would not have occurred. Probably true, but there are a great number of potential targets (we've recently seen movie theaters and malls shot up as well.) Even if we limit protection specifically to schools, there are thousands across the country - do the resources to provide this kind of security exist? One response to avoiding the cost is the classic libertarian argument that more people should be armed. This may not be a fruitful path. The libertarian argument is that an armed society is a polite society. Maybe, but I have a bit less confidence in human reason. While armed individuals might prevent these massacres, but there would be a corresponding increase in disputes escalating to gun-play. Also, from a personal perspective, this means I have to carry a gun - or risk being at the mercy of those who do. I frankly don't want the responsibility, I'm quite happy to outsource public safety to the police. There may be other methods of hardening the targets. Increased school preparation for this kind of scenario may save lives and physical security might also be deployed. Finally, there may be creative ways to get responsible individuals who are licensed to carry firearms into schools. Could room be made for retired police officers and military personnel to become teachers? This seems like a potential win-win. Assuming offering blanket armed protection to all schools is not realistic, could smaller scale steps improve school security? This would not be as dramatic, but might be more practical. There has been much discussion about improved mental health screening to prevent these kinds of incidents. As with the issues discussed above, this is hardly a panacea. Also, first and foremost, we do not actually know anything about the mental health of the shooter. Everyone on the internet is assuming some sort of mental illness, but these are arm-chair diagnoses. That being said, improving mental health access and efficacy would be a very good thing. But mass mental health screenings would be problematic. Just like in screening for terrorists - there would be a great many false positives (probably far more than true positives), and false positives are expensive. A person falsely labelled might have their life ruined or might sue, embarrassing the responsible agency. In addition, this too might be a path to a deeply coercive and intrusive state. The appropriate policy response would probably be to provide substantial grants both to existing mental health programs and for more research on the issue. But a useful additional area of study might be the legal aspects of mental health. Careful studies of how to balance the competing priorities of freedom and public safety in regards to the mentally ill would be very useful. This is a great challenge since, by its nature mental illness hampers the ability of those who suffer from obtaining help, but allowing the state force help on the mentally ill is a power that can be abused. Further consideration of these issues may help contribute to the more effective delivery of treatment to those who suffer mental illness. Quite simply, there is no realistic policy just sitting on a shelf that would guarantee such massacres do not occur. But there are many more modest policies that could reduce the likelihood of such massacres - they are well worth pursuing. Historically, the right strategy in Afghanistan was staying out of the place. But it is too late for that, and simply seeing the country fall into the hands of monstrous and brutal thugs like the Taliban would be difficult for the United States to stomach. American strategy in Aghanistan has focused on quantity and breadth rather than quality and depth. Counter-insurgency, as the eminent scholar Elliot Cohen has noted, "is a valley-by-valley" war. What he means is that success requires an enormous amount of very specific local knowledge about a region. Given this kind of knowledge of tribal structures and inter-tribal relations, as well as the preferences of key individuals, combined with the ability to provide goods that these local leaders want, a dynamic individual can achieve modest amounts of influence. But acquiring this level of knowledge takes a great deal of time (years, maybe decades) and then, when this knowledge is possessed, the influence that can be achieved is modest. But this may be the only path in a place like Afghanistan where daily life is difficult and societies tend to be cautious and conservative - knowing that change can often be for the worse. The question is, with the Taliban resurgent, what would it take to make such a strategy viable. This COIN stuff is really hard and takes forever - not having any practical experience I tried to put it into terms a soft suburbanite arm-chair analyst (like myself) can grasp. The Afghanistan of much of the 20th century was a soft monarchy. Kabul was a modernizing city and the country stayed together. Life there was undoubtedly less than ideal, but absolute chaos was avoided and there were at least some options for improvement. I've taken on this question before. The main alternatives would be to abandon the place, leaving it in the hands of the vicious Taliban and allowing it to again become a source of regional instability. We could just continue to do what we have been doing - but the US doesn't have the resources for a full-scale counter-insurgency and the present policy is probably a greater expense than the benefits it can realistically accrue, plus it gives Pakistan too much leverage over US foreign policy. The key is to maintain sufficient military capabilities to back up the Afghani forces (and continue to train them - although the prevalence of insider attacks makes this seem hopeless.) But after the Soviets left, the Afghani government held out longer than anyone predicted and with only limited outside support. Could the US back-up a regime in Kabul and work with that government to slowly (glacially) spread its writ across the country. This is probably the strategy that needed to be adopted from the beginning instead a beginning of apathy followed by a period of frenetic attention. This probably the path that should have been followed in exiting Iraq - but did not happen when a status-of-forces-agreement could not be reached. There is still time in Afghanistan to do at least some things right. Hanukkah, Athens vs. Jerusalem & Vice Presidents? Jews around the world are now well into Chanukkah, which like most Jewish holidays has some really fun surface stuff (presents, gambling, and fried food), and deeper meanings. Hanukkah celebrates a military victory. During the Hellenic Age, Israel was under the rule of Selucids of Syria - a dynasty established by one of Alexander the Great's generals. He sought to Hellenize the Jews. Plenty of Jews were open to this new culture, but traditionalists opposed it and when the Greeks began pushing for pagan sacrifices in Jewish temples the traditionalists revolted. The Jews won, threw off the yoke of Greek oppression and made a holiday out of it. But this goes deeper because it was a clash between two already ancient yet revolutionary civilizations with deep cultures. It is a clash that has continued through the ages in various forms. Perhaps now it is best understood as a tension, but this tension often referred to as the conflict between Athens and Jerusalem is one of the great drivers of Western civilization. I will not elaborate on this conflict. I remember the speaker at my graduation from St. John's College characterizing it as the conflict between freedom (Athens) and equality (Jerusalem) and he didn't have much use for the latter. I didn't have much use for the speaker. I thought the conflict was more reason vs. transcendence - but I'm just a tourist in this land. It might be spinakopita vs. falafel for all I know. But there are big differences between Greek and Jewish culture. Inscribed at the Temple of Apollo at Delphi are the words "know thyself." Inscribed above synagogue arks around the world are the words, "know before whom you stand." People visited the oracles seeking wisdom and advice about the challenges they faced and for help making tough decisions. There are more than a few stories about generals seeking the oracular wisdom before a crucial battle. The visit to the oracle was to obtain information to help the seeker move forward in the world and for that knowing oneself is of great value. But at synagogue people stand before the Almighty to pray. Certainly one can pray for benefits, but prayer is much more complicated than that. It might be understood as a humbling connection with the awesome existence of all creation. The inscription above the ark is a rejoinder that what is being done is no joke and that the one praying is a tiny piece of an enormous cosmos - wisdom is to be found in humility. Perhaps the conflict between Athens and Jerusalem can be characterized by AJ Heschel's characterization of space and time (or maybe Saul Bellow on the self vs the soul). Space is the physical world around us. Greek discoveries in science, technology, and organization dramatically expanded humanity's ability to master the physical world - a baby step towards the comfortable modern society we currently enjoy. We are tiny in the face of the universe, but in our immediate human dominated surroundings we can forget that. Time, in contrast, is simply beyond human control and quickly stretches our powers of comprehension. The best we can do is come to terms with this. Jewish theology and practice can provide some small succor and give birth to other monotheistic religions that could also provide this comfort. Right, but let's bring this back to my obsession - the vice president. The words at Delphi and the words above the synagogue ark are both useful pieces of wisdom - but they depend on one's circumstance. The President, has risen to the pinnacle of achievement, but faces the endless challenges of the one on top - the big boss. The President must know him (her) self. What are my strengths, weaknesses, what can I do and what can't I do? In consulting the oracles (political consultants) the President must weigh their advice against his own abilities and tendencies in his efforts for worldly success. The Vice President is effectively powerless, except when the President listens. The Vice President requires tremendous humility - not easy for a politician who is extremely accomplished in their own right. Presidents are not the Almighty - but a Vice President must know the one before whom they stand and be humble in the face of their ultimate responsibility. OK - it was a reach - but this is how people writing dissertations start to think. If there is an oracle for PhD students it should probably have the wisdom - know for whom you write. When asked "How's your wife?" the great comedian Henny Youngman replied, "Compared to what?" The same question could be asked about these fundraising totals. Certainly they are higher than past totals, but combined they represent less than $8 per US citizen - and that's over four years. So annually, spending on Presidential elections totals less than a gallon of gas per person. How is that too much to spend in informing the American people about the critical choice of who should hold the nation's highest office. It is true that money goes along with access, which can turn into influence. There are innumerable special interests that game the system, but most interests have counter-interests that are also well-funded. Are there political distortions resulting from influence linked to election funding - almost certainly. But there is no political system that guarantees optimal outcomes. Whatever changes might be made to the campaign finance system, it's architects and enthusiasts should beware of unintended consequences. It turns out many of the other Arena contributors made the same point - although more than a few took the opposite position. However, none of the quoted Henny Youngman - who I revere. I actually worked at Common Cause many moons ago. The primary issue at the time, the Internet was just beginning its path to ubiquity. We pushed for full, timely, online disclosure of campaign donations - a cause with which I am eminently comfortable. But I also began to wonder why we make our politicians spend so much time raising money. I began to wonder if the problem was that there was not enough money in politics. It should be easier for candidates to raise money. Public funding might reduce the problem, but it is in matching money, so politicians would still need to spend lots of time fundraising. And if they were good at it, they might forgo the matching money and its spending limits. Or, it could allow well-entrenched incumbents to easily raise the money they need and scare off challengers. One possible reason for the increase in expenditures is the decline of the parties, which were more reliable vote machines. But of course this was in the era of big-city bosses and political machines - hardly an inspiring example. I won't say I'm unconcerned about distortions caused by influential groups - from trial lawyers to prison guards to teachers (and many, many others.) But ultimately the best way to beat an organization is to organize and our system gives enormous opportunities to do so. Last week I headed into town to see Pakistan's Finance Minister Abdul Hafeez Shaikh discuss the challenges facing his country. The complete video and audio of his appearance as well as a good summary of the event are available on the website of the host, the Carnegie Endowment for International Peace. The Minister was two important skills, he is a charming, engaging figure and he is a capable technocrat. Pakistan has a mature banking system and some very capable people. Shaikh argued that the civilian government inherited a disastrous situation of high inflation and deficits in 2008. Before these had been adequately dealt with Pakistan was hit with the devastating floods of 2010. Despite this, the Minister argued that the government had managed to take important steps in restructuring the economy included reducing subsidies, increasing regulation and tax collection, and increasing revenue sharing between the federal and provincial governments. Pakistan's government has also been innovative in using technology to deliver aid to those in need and worked hard to comply with money-laundering provisions. The Minister's response was that these were technical differences between experts over measurement and data. But that doesn't really cover the scale of the differences. But these problems aren't going away. As I've written elsewhere, Pakistan is on an unsustainable path. Without dramatic measures, the nation will be unable to support its population. Pakistan's leaders are playing a losing hand well - but it is still a losing hand and bluffs won't be enough. Last week, in the Metro section, The Washington Post ran a fascinating article about the nuts and bolts of an FBI counter-terror operation. The story focuses on the FBI's arrest of Amine El Khalifi, a Moroccan immigrant who was arrested "wearing what he thought was a suicide coat" as he walked towards the U.S. Capitol. At nearly every meeting, FBI agents said, [the FBI undercover agent] asked Khalifi whether he was sure he wanted to launch an attack and whether there was a more peaceful way to engage in jihad than killing people. In past investigations, other suspects have walked away from similar plots and not been charged, FBI officials said. At one point, Khalifi became so frustrated by the questions that he told the undercover agent to "stop asking him if he wanted to do this," the case's lead agent said. There is also the question of whether or not this is an effective counter-terror policy. The capability of a small group without training or access to external resources to carry out a major terror operation is limited (not impossible - as the Norwegians learned. but also as Nidal Hassan demonstrated.) But the lone wolf terrorist is extremely hard to predict, and even increasingly the likelihood slightly would undoubtedly require a vast increase in domestic intelligence. A basic uncomfortable reality of the relatively open criminal justice system in the United States is that operations like this reveal an enormous amount of information about how the FBI operates. Eventually, whether through the press or the trial, these details will be exposed. Clever enemies could make use of this information to improve their internal security and avoid law enforcement attention. On the other hand, revealing this information - which shows a truly extensive and deep FBI capability - might deter terrorists from even trying. Still, the danger that focusing on these less capable actors may actually help forge a stronger adversary is not inconceivable. The terrorist groups that survive and thrive are those that are most capable of analyzing information and incorporating the lessons learned. These operations provide plenty of data. Of course it is an open question as to whether or not such a sophisticated opponent is operating within the United States (there is little question that such opponents are operating abroad targeting Americans and their allies.) But the concern that the FBI, in focusing so heavily on these relative small fry might be missing some major new shift and be blind-sided. It is an unfortunate truism that bureaucracies tend to keep doing whatever they have been doing until some new phenomenon occurs that confounds standard operating procedures.